About Me — Krystal N. Clark, M.Ed. Sit in the front row of your life. Krystal Clark, M.Ed., a native of Portsmouth, VA., earned her B.A. in Sociology/Psychology at the College of William & Mary in Williamsburg, VA and her M.Ed. in College Student Personnel at the University of Maryland, College Park. Upon graduation she moved to Durham, NC where she served as the Program Coordinator for Fraternity & Sorority Life at Duke University and in 2011 Clark moved to Nashville to take on the role of Associate Director of Greek Life at Vanderbilt University. In 2013, she was selected to be the Associate Director of Student Leadership Development and in 2015 she was promoted to Director of Student Leadership Development. In 2018, she became a Gallup-Certified Strengths Coach and uses this tool to develop individuals and teams. Her Top 5 Talents Themes are Input, Achiever, Harmony, Maximizer, and Significance. In 2017, Krystal became the first African American President of the Junior League of Nashville in its 96 year history. Krystal is a member of the Class of 2015 Nashville Emerging Leaders and is also involved locally and nationally with Delta Delta Delta Fraternity. Clark was a finalist for the Nashville Emerging Leader Award in the field of Education in 2012 and was the Junior League’s 2015 Young Professional Nominee for the Nashville ATHENA Award. She is an alumnae of New Leaders Council and is a member of the Class of 2017 of Leadership Nashville. Clark is also a member of the Friends of Nashville Ballet and will serves as Co-Chairmen of the 2019 Ballet Ball Late Party. She is a member of Friends of Monroe Carell Jr. Children's Hospital at Vanderbilt,a member of the Tennessee State Museum Young Professional Council, a member of the Board of Directors for The Women’s Fund and served as the 2018 Grants Committee Co-Chair, Vice Chair of the Board of Directors for The Belcourt Theatre, and the 2018 Chair of YPNashville. Because of her undying love for her alma mater and leadership development, she sits on the Leadership Advisory Council for William & Mary. Clark is a former Big Sister for Big Brothers Big Sisters of Middle Tennessee and in 2015 served as a member of the Franklin Wine Festival Royal Court to raise money for the organization. She’s a past member of the Board of Directors for Girls on the Run Middle Tennessee and is the founder of Starting Line- Young Professionals for Girls on the Run. Due to her love of reading, Clark served as a Reader for Book ‘Em/Reading is Fundamental and held a book drive that raised hundreds of books for children in Nashville. She also collaborated with the Hannah Project Prostitution Intervention Program to hold a drive which raised over 1,000 feminine hygiene products for program participants. 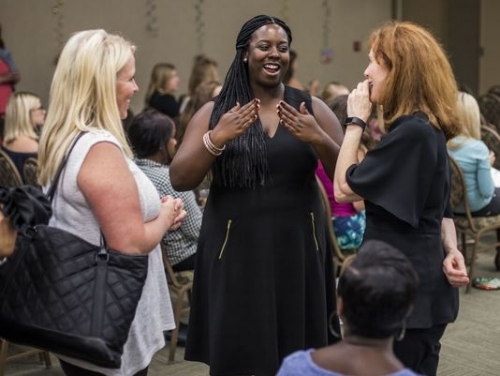 When she’s not working at Vanderbilt she serves as a speaker and facilitator for fraternal organizations, educational institutions, businesses, and non-profits across the country. She is the creator of S.A.I.L (Success, Authenticity, Innovation, and Love), a series of personal development workshops for women in Nashville. She contributed to The Freshman Project: A Collection of Practical and Clever Advice about the College Experience offering advice to first-year college students and their support network about seeking leadership opportunities in the collegiate environment and has blogged for Levo League, Mavenly + Co., Girls to the Moon, YELLOW, and Creative Souls Tribe. Working out, reading, acting as a residential Nashville tourist, listening to podcasts. sending out Doodles to gather friends for fun times, concerts, and watching sports documentaries is where you’ll catch her in her free time.